In Ground and Above Ground Spas: Which Should You Get?In Ground and Above Ground Spas: Which Should You Get? 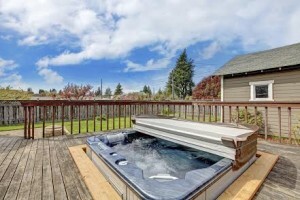 In Ground and Above Ground Spas: Which Should You Get? If you’re planning on investing in a spa, you may be wondering exactly where you should place it, and how. There are a lot of factors that go into this decision. If you’re planning on investing in a spa, you may be wondering exactly where you should place it, and how. There are a lot of factors that go into this decision; placement, cost, aesthetics and use. And while spas are wonderful, they also require maintenance that you should be considering. Such an important decision shouldn’t be overlooked. So, here are some things to think about when you’re contemplating where to put your spa. Spas that are closer to the home will probably be used more often. This is most commonly achieved with an above ground spa. This means no one will have to run out in cold weather for very long if you intend to use your spa year-round. In warmer climates, installing an in ground spa may be a great option, because you’ll be using it frequently. How much can you care for it? Above ground spas typically require less maintenance, and have covers that are easily removable with lever systems. If you’re willing to put in more time for maintenance, an in ground spa might be what you’re looking for. In ground spas also have parts that are backed with less of a warranty. Generally, parts for above ground spas have warranties for up to 3-5 years. In ground spas are beautiful, and there’s no doubt about that. Spas that look like small hot springs fit wonderfully against the side of an in ground pool. Spas that are naturally surrounded by greenery is also very relaxing, especially if the bottom of your spa is darker in color and gives the illusion of a pond. Above ground pools are generally less aesthetically pleasing. There are ways to disguise its structure, but it is probably going to look like it sticks out unless you know exactly how to place it within your landscape. Need a spa installed? Sunrise Premier Pool Builders knows exactly how to help! We offer full pool maintenance services, repairs and openings/closings. Our services come in convenient packages, so you can make sure you’re getting the most out of your investment. If you are ready to design the perfect pool for your home, contact the experts at Sunrise Pools & Spas. For more information on our services, contact us online or give us a call at 410-349-3852. To see examples of our work, check us out on social media on Facebook,Twitter, LinkedIn, Pinterest, and Google+. This entry was posted on Friday, September 16th, 2016 at 6:44 pm. Both comments and pings are currently closed.